Hi lovelies! I don't know what it is, but I am so motivated to get creative stuff done lately. I feel like I have been in a perpetual rut for the past year, but, now it's finally lifting. The clouds are parting, the skies are clearing... and all is well in the world. I might be old fashioned, but I love giving housewarming gifts and hostess gifts. I'm trying to do this thing where I celebrate even the smallest things in life. Even if it's just someone moving into a new apartment or a friend having me over for dinner. These are all the things that make life so amazing, so why not acknowledge the happy moments with a little gift? This idea was inspired by my good friend, Sarah. We stopped by Michaels during lunch one day and she saw these little test tubes with corks in the fun little bins by the registers and told me her idea. I immediately asked if I could poach it and share it with you guys. I came up with the leather wrap and metal tag, though. The tag idea came about when Martha Stewart asked if I'd like to try out their new metal stamping kit and sheets of metal. Of course, I said, "HECK YES". First I have to say that the sheets of metal in the pack are GORGEOUS. There's a copper hue, gold hue, then a rubbed bronze kinda hue. All absolutely stunning. Secondly, although the idea of this metal stamping is pretty awesome, I felt it difficult to execute well. I did not have the "rubber stamping mat" they instruct you to use the tool with, so I improvised and used a towel. It worked... kinda. I had to go over the letter with the end of tweezers to really get the detail to show. I'm going to get the rubber mat eventually and see if the stamp works any better. So now onto the little gift. 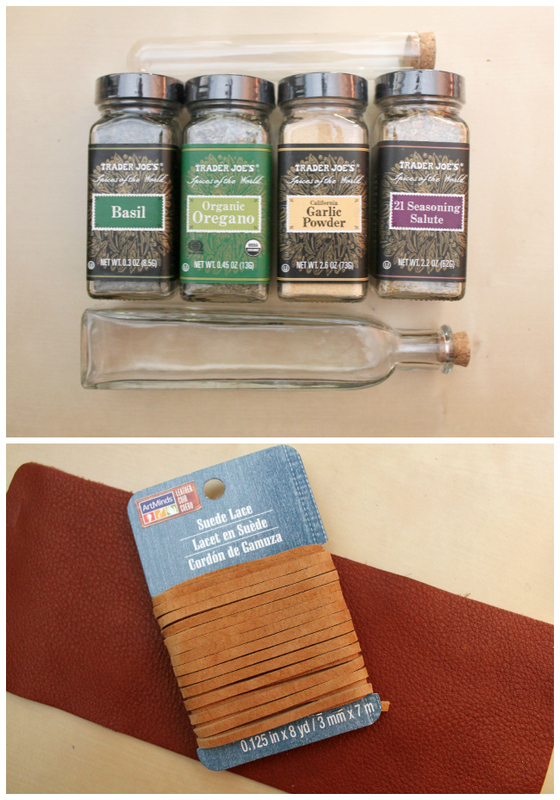 You need a bunch of spices, EVOO, one of those nifty little corked test tubes that you can get at Michaels, and a small bottle with a cork also from Michaels. 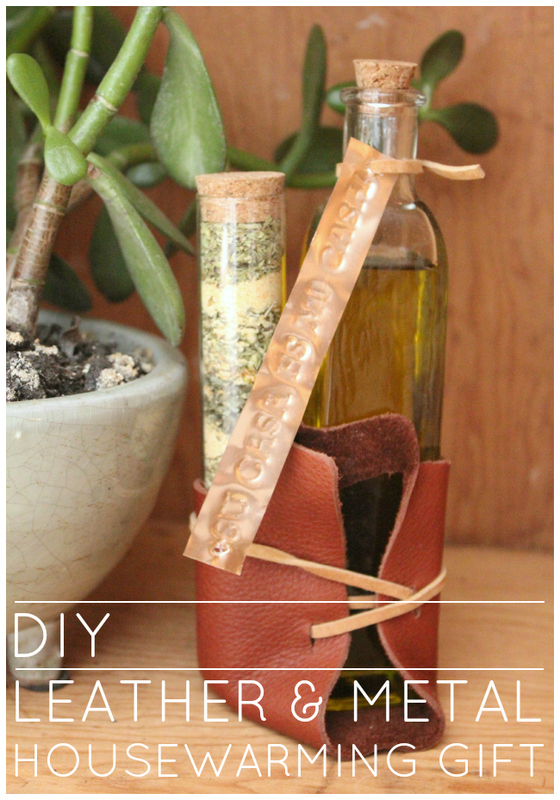 You will also need a piece of leather and some leather cording. Again, both found at Michaels. Layer and mix the spices into the test tube and then cork. Fill the bottle with EVOO and set aside. I found this pre-cut, pre-shaped piece of leather and cut slits in it as shown below. The slits on the short ends are what you will slide the test tube and the bottle. The tiny slits on the long slides will be wear you lace the leather cording. Below, you can see how the glass items slide into the slits in the leather. Cut an extra long piece of leather cording to lace into the tiny holes and then wrap around the entire package and finally tying. 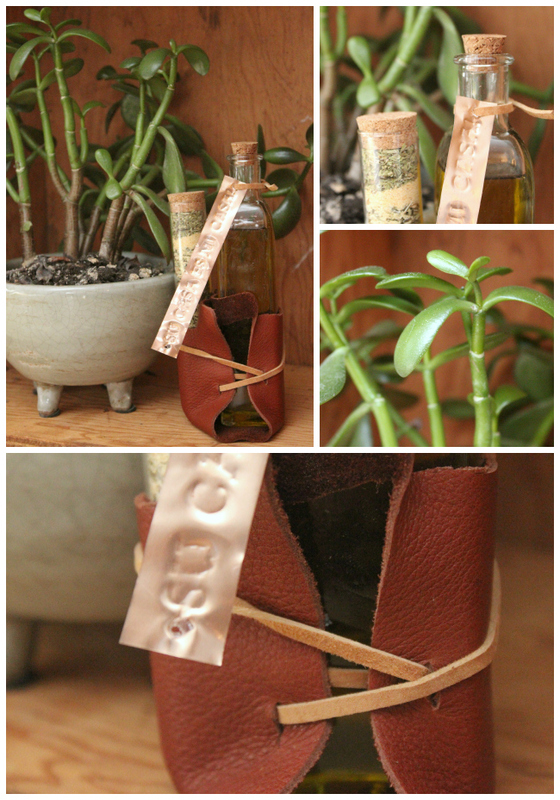 Take a smaller piece of leather cord and tie your tag on. TA-DA! 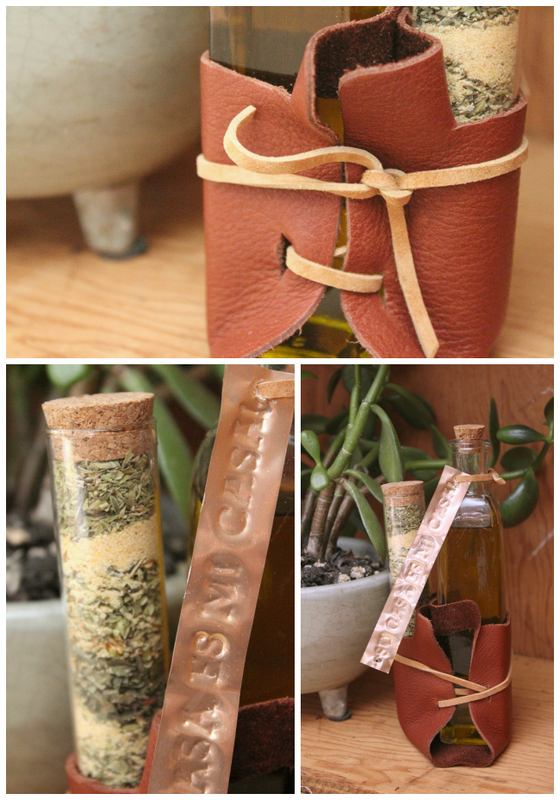 A super adorable, minimal, rustic looking housewarming gift that will be just as delicious as it is cute! Disclosure: I received one or more of the products mentioned above for free in the hope that I would mention it on my blog. Regardless, I only recommend products or services I use personally and believe will be good for my readers. I am disclosing this in accordance with the Federal Trade Commission's 16 CFR, Part 255: "Guides Concerning the Use of Endorsements and Testimonials in Advertising". So you all know me... you know I'm a cat lady. Not quite crazy yet, but steadily approaching, I think. 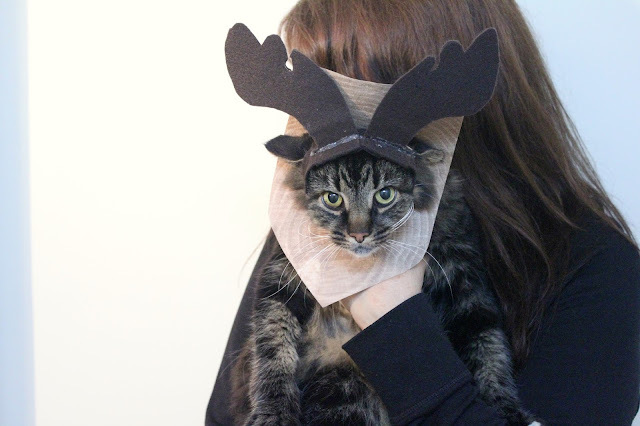 When the #MichaelsMakers challenges are posted, most of the time I immediately think of something insane I can make for my cats. Well, this month's costume challenge was no exception! 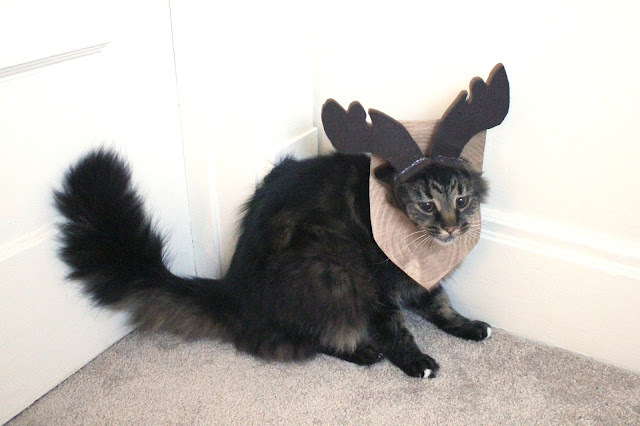 I decided to turn my cat, Skilo, into a whimsical jackelope type creature... hence, I present to you Cat-Moose. As you can see, Skilo loves me. You can see it all over his face. See... That look says, "Mom, I love you, my life is better because of you and these antlers you've crafted with love for my adorable head." 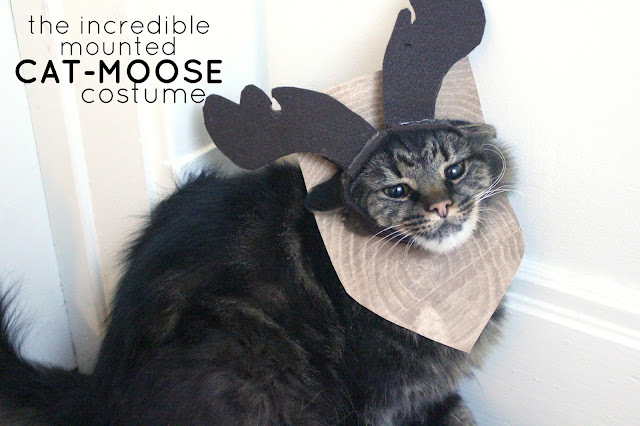 I know you're all dying to know how to make your own Cat-Moose or, dare I say, DOG-Moose... so let's get to the tutorial! First and foremost, you have to sketch out your moose antlers. 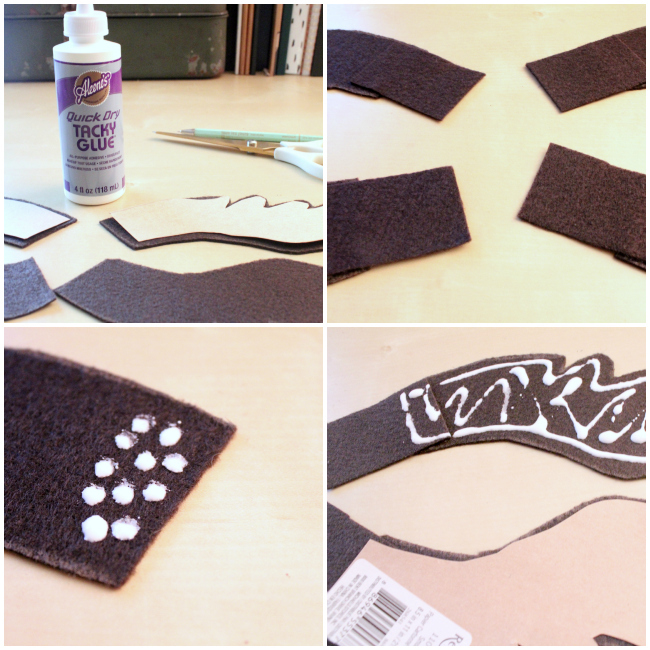 Cut them out of cardstock, then use that as your stencil for the felt. Make sure to leave about 1/8 inch between your chalk line and stencil because the card stock is going in between the two pieces of felt to give it some structure. You want 2 sides for each antler (obviously). 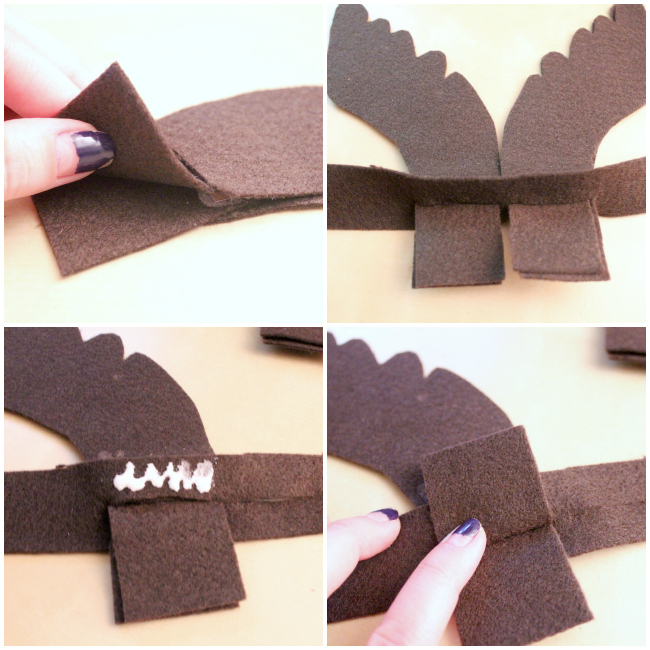 Next, cut strips of felt about 3 inches long an as wide as the base of your antlers... you want 4 strips. Glue one strip to each antler piece (about 1 inch overlapping). 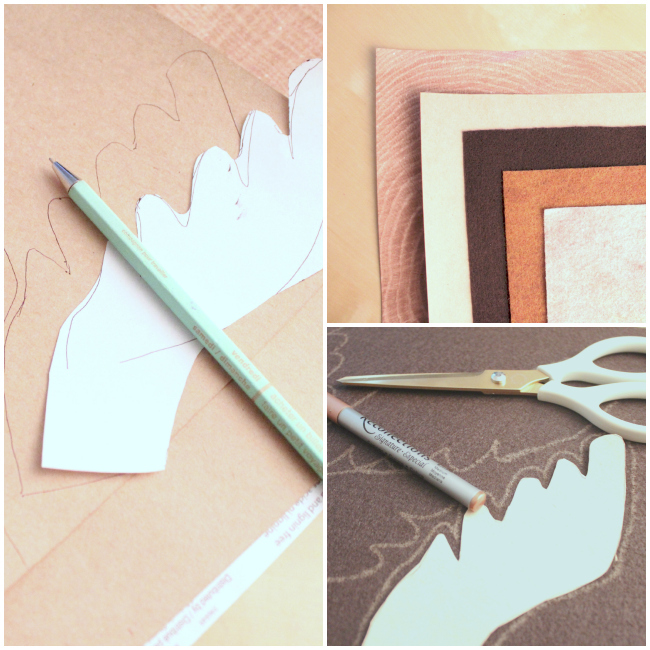 Once that is done, glue the card stock and the 2 antler pieces together. Now you want to cut the band that will go around your pet's head. Mine is about 1.5 in wide. Find the center of it and cut 2 slits the width of the base of your antlers, about 1/2 inch apart. 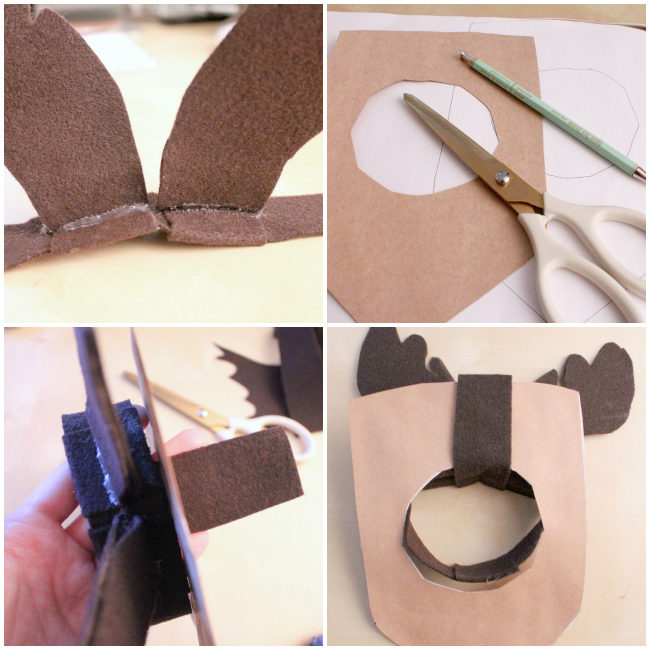 Fit the flaps at the end of your antlers through the cut. You will then fold it out and glue to the under side of the strap, then fold it up over the top and do the same. 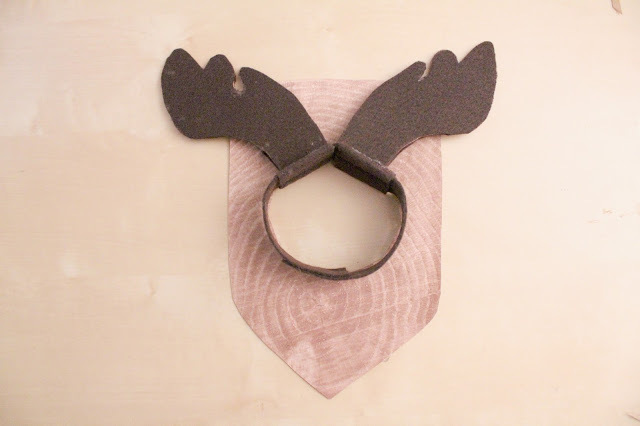 Where the strip meets the antler, reinforce it with hot glue to make sure the antlers stand upright. 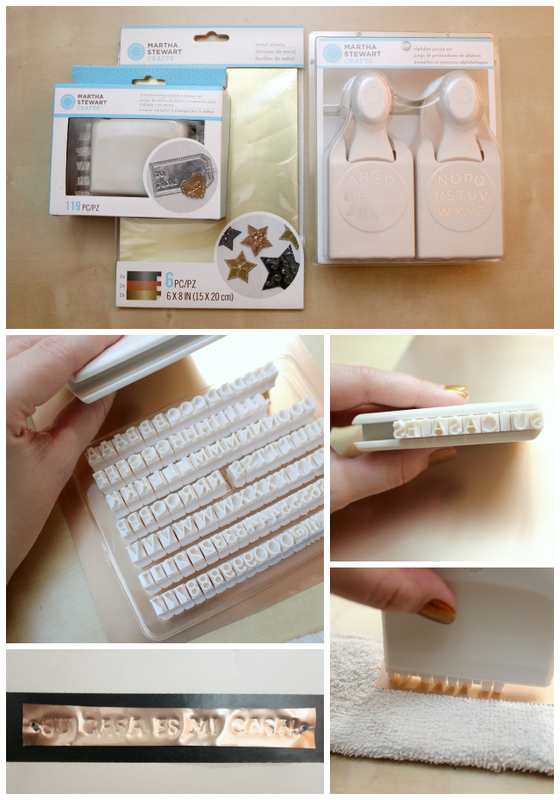 Next, make your plaque! I cut mine out of card stock first then layered the faux wood grain paper over top. Once that was done, I attached the antlers with a strip of felt and hot glue. There you have it. Now all you need to do is stick your pets head through the hole and you have a whimsical creature as a pet! Can we give props to my Mum for modeling with my kitten?? 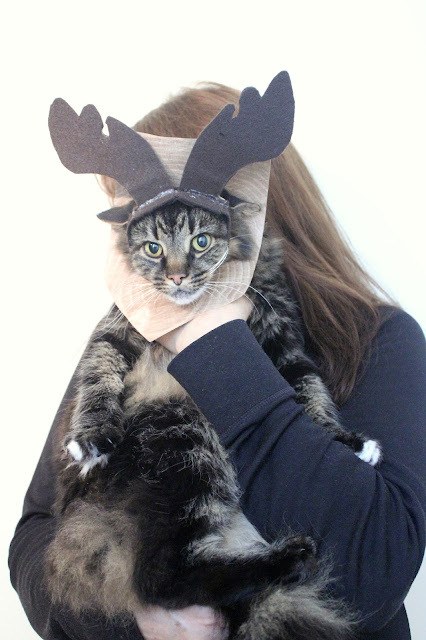 When I'm having a bad day, I put the antlers on my cats and just laugh hysterically at their expense. Does that make me a bad person? I think they secretly like it. 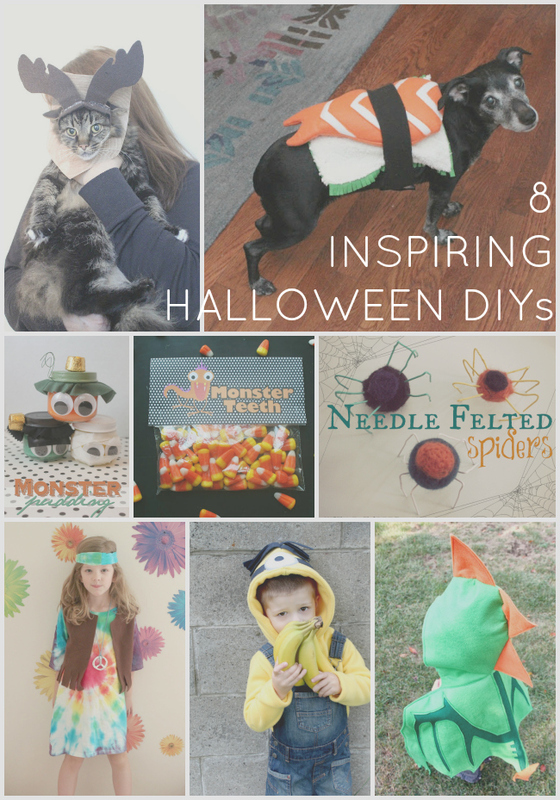 Make sure you check out all the other awesome costume ideas from the #MichaelsMakers!